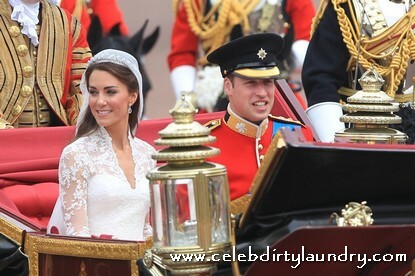 Prince William and Kate Middleton have been pronounced man and wife at Westminster Abbey. They have left the Abbey, with Kate Middleton now the Duchess of Cambridge, amid cheers from thousands of well-wishers lining the procession route. They are making their way to Buckingham Palace where there will be a buffet reception for 650 guests. Despite clouds overhead and the threat of rain, Prince William and Kate Middleton are braving the risk of bad weather and riding to Buckingham Palace in an uncovered carriage, so the public can have a better view of them. Outside the abbey, an estimated one million royal-watchers gathered on the streets of London to join in the celebrations. Two billion people are thought to have watched the event live on television around the world. On arrival at the palace, the band of the Welsh Guards will play the British National Anthem before the royal couple is expected to appear with Queen Elizabeth II on the palace balcony to greet their adoring public. A fly-past by the Royal Air Force and Battle of Britain Memorial Flight will take place before the Queen hosts a private lunchtime reception for selected guests.